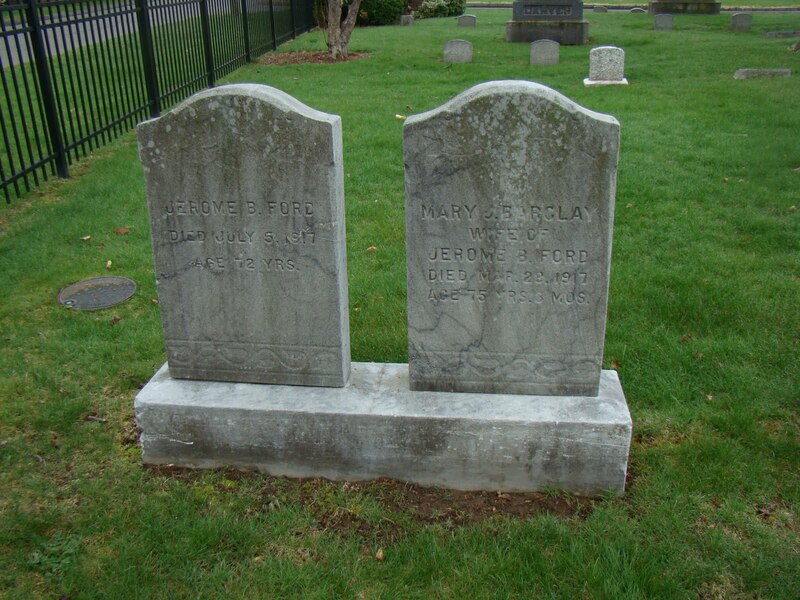 At the Bristol Public Library there is a History room and I was able to find the cemetery where Mary and Jerome Ford were buried. They are in the Forestville Cemetery. They are featured on Find A Grave but I will share the pictures that I took that day when I visited this cemetery in 2011 on my trip to Connecticut. I share my visit on my Massachusetts Meandering Blog, see right side panel of this blog for a link. I was looking for Mary J. Barclay Ford and Jerome B. Ford and there three daughters. I knew about Mary J. from the estate file of my great-uncle Alexander Barclay. Mary and Alexander were siblings of my great-grandfather George A. Barclay. I have been tracking her and it was exciting to know that I had an obituary for her and her husband. The Forestville Cemetery is on Circle Street in Forestville. I found it by going along W. Washington St. to Center and then to Circle. It is a very well-kept cemetery and easy to get around on the paved roads which are numbered 1-4. The information I had obtained from the History room in the Bristol Library gave me other names on tombstones to use to try to identify my family. They have a cemetery book with listings done by rows although the rows are not identified you can tell by the page number approximately where the graves might be. You could call the Forestville Cemetery Association. Most cemetery jobs are part-time so you do have to be patient. I didn’t do that but decided I could figure it out myself. 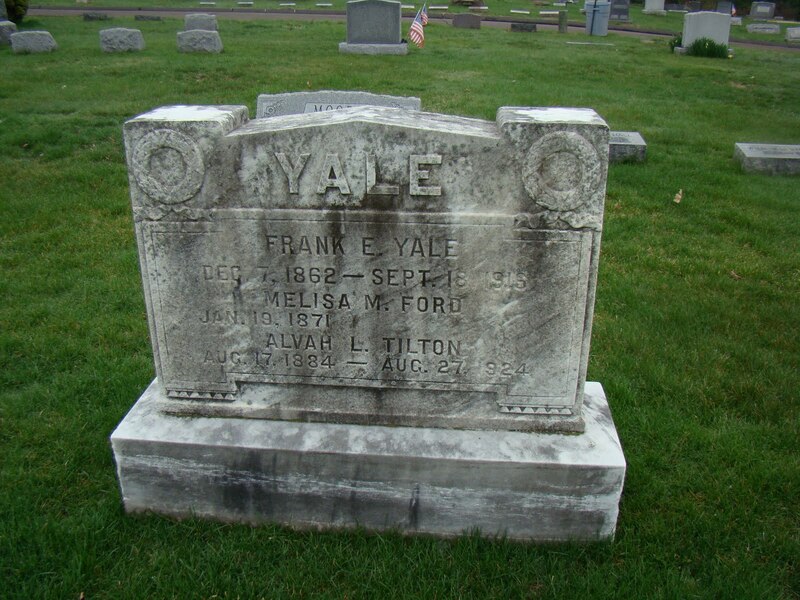 It took a while but I did find them, actually I found Frank Yale’s tombstone first and Melisa M. Ford but she didn’t have a death date? A Tilton was buried with them? Jerome Ford and Mary J. Barclay Ford were buried over by the fence and right off road #3. It was good to see the graves. Next to them was their daughter Rozelia who died at 18 years old? In Mary’s obituary grandchildren are mentioned. We now know that Melisa died in El Cajon, San Diego Co., California where her son Alfred had gone to live. I have not found her gravesite at this time. She migrated after 1930 and was there by 1940. Frank E. Yale was Melisa’s first husband and father of her son Alfred. The person named Alvah Tilton was Melisa’s 2nd husband who died in 1924. I cannot image how hard that must have been for her to lose two husbands within a decade. 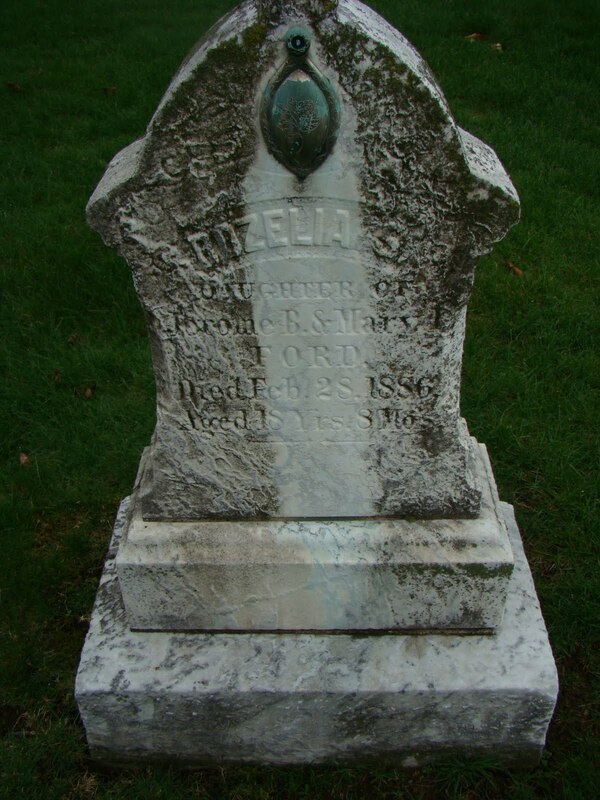 This entry was posted in Alexander Barclay, Alfred Jerome Yale, Alvah L. Tilton, Bristol, California, Connecticut, Forestville Cemetery, Genealogical Research Trips, George Angus Barclay, Jerome B. Ford, Mary J. Barclay, Melissa M. Ford & Frank E. Yale, Rosalie Ford, Yale surname and tagged Bristol Public Library, Cemeteries in Connecticut, Forestville, Migrating from Connecticut to California. Bookmark the permalink.